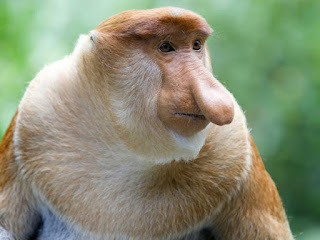 The Proboscis Monkey gets it name from its large, pendulous nose. Females have smaller upturned noses, although they are still larger than other species, but the noses of the males are so large that they hang down over their mouths. When they are excited or angry, they make loud honking noises, which make their noses stand out straight. To add to this bizarre appearance are their large pot bellies. Proboscis monkeys have several stomach compartments filled with cellulose digesting bacteria which allow them to digest and neutralise the toxins in certain leaves. Their stomachs take up a quarter of their body size and make the proboscis monkeys look permanently bloated. Proboscis monkeys are endemic to Borneo and live in mixed dipterocarp and mangrove forests. They are most active early in the morning and just before nightfall. They will rest during the rest of the day and settle down for the night usually by river bank to protect themselves from predators such as the clouded leopard, They have partially webbed feet which allows them to swim across rivers to feed on young leaves or as a means of escape when they are threatened. There are two social levels within the proboscis monkey community - the all male bachelor group and the harem which is made up of a dominant male, females and juveniles.